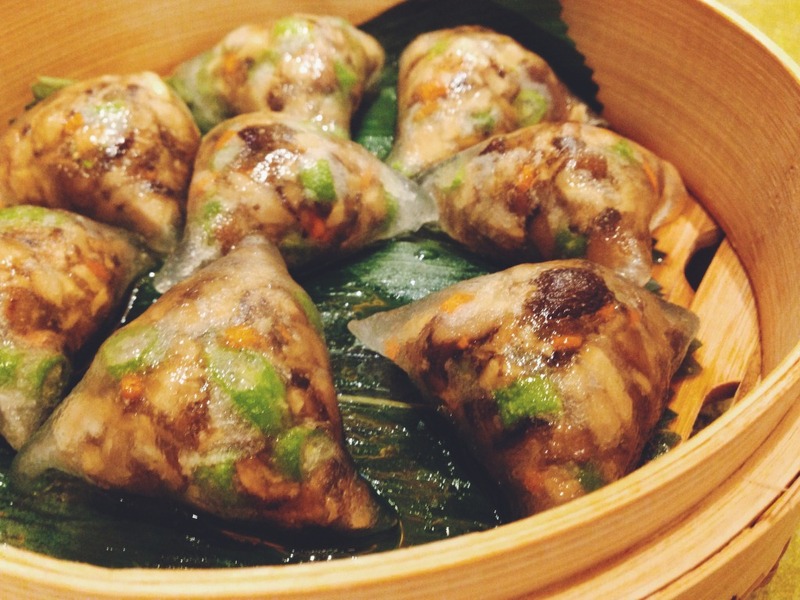 There are a plethora of dim sum haunts in Singapore, but only a handful of places have excellent renditions of the bite-size treat. Royal Pavillion is one of them. We know this Cantonese restaurant treats its food seriously when we were greeted by its opulent chandelier priced at a hefty $80,000, dangling over a mini fortress right smack in the middle of the elaborately decorated space, which can house up to 142 people. This mini-fortress is flanked by partitions with intricately cut patterns, which will be a hit for those who want to remain seen yet cloaked with mystery, as one still remains partially hidden behind the partitions. 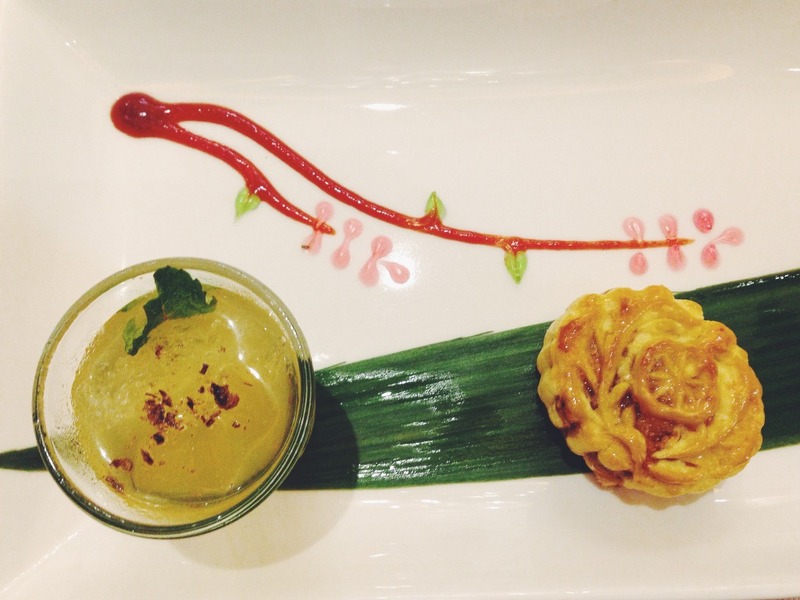 Royal Pavillion, helmed by Executive Chef Chung Ho Shi, is a remarkable find for dim sum lovers. We know Chef Chung must be doing some thing right if the least experienced chef on his team has at least 10 years under his/her belt. The Crispy Shredded Radish Pastry Roll (featured above), was particularly good. Crisp on the inside and well-matched alongside the moist, savoury yet not overpowering radish within, this pastry roll could easily be placed in a class of its own. The dim sum baskets came out in waves, and we were swept to shore with the Steamed Vegetarian Crystal Dumpling. It is not hard to imagine veggie lovers going gaga over this translucent bite-sized delight, with its delicately made skin wrapped over the tasty combination of mushrooms and greens. 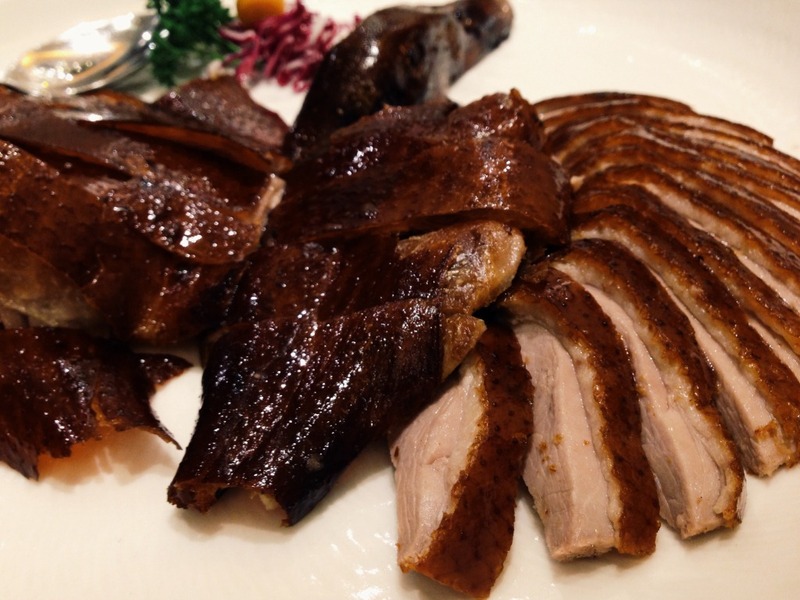 As expected, the skin of the Royal Smoked Duck (S$35 for half-portion; S$68 for full-portion) was roasted to a light crispness. But what won us over was the residual smoke of lychee wood that lingered on its skin which elegantly enhanced the moistness of the duck meat. We are glad to pronounce that this particular duck didn’t die in vain. A Cantonese restaurant is only complete with a dish incorporating treasures of the sea. 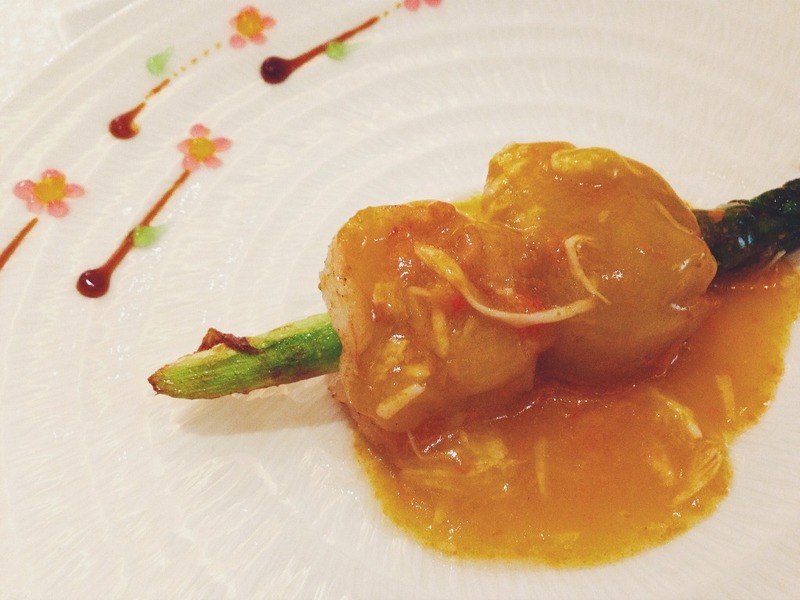 The Sautéed Seafood Duo Skewer topped with Crab Roe (S$14) had crab roe whisked lightly into a beaten egg, cleverly paired with a wholesome Hokkaido scallop and huge prawn, gingerly skewered through a crunchy stalk of asparagus. The Wok-fried Mashed Fish Noodles with Lobster in “Lao Gan Tie” Sauce (S$28) is a dish like no other. The fragrant wok-fried noodles is not made from flour, but fish – which lends the noodles a springy texture. Just picture your typical QQ fish balls rolled into long strands of noodles, simply divine. 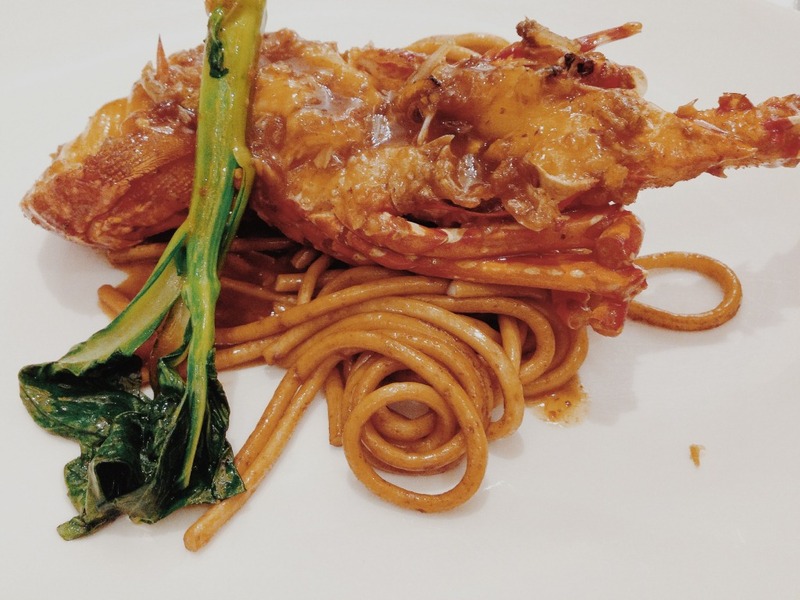 Coated with Chef Chung’s special sauce, “Lao Gan Tie” (“Old Godfather”) which comprises of fried chili sauce with mini-whitebait, the tenderness of the lobster paired alongside this dish was brought out. I confess that I have a weakness for yam paste. Royal Pavilion’s Steamed Mashed Taro with Pumpkin Puree served in Young Coconut (S$8.50) although sadly not mind-blowing, was definitely comfort food for me. Using au naturel ingredients, the yam, pumpkin puree and coconut sauce was stirred into a sweet, healthy combination. For those with a sweet tooth, look no further than the Special Walnut Pastry (S$3.80 per piece with a minimum order of 4). Fresh out of the oven this mooncake-like pastry melts in your mouth and leaves a saccharine, albeit a tad too overwhelming combination of baked walnuts, dried fruits and melon seeds. Whilst the dim sum and mains were irresistible, we thought the desserts lacked the final midas touch to end off a fulfilling meal.